MK Regev calls MK Zouabi 'traitor' for joining flotilla, others dare her to go live in Gaza. MK Michaeli tries to pull Zoabi off the rostrum. Scene from the stormy debate. Monday's high seas showdown between Muslim jihadis and Israel Navy commandos reached the Knesset plenum Wednesday, and four parliamentarians – one Jewish, the others Arab – were ejected in the course of the fiery debate. The session centered upon MK Hanin Zouabi (Balad), who had been on one of the flotilla boats. 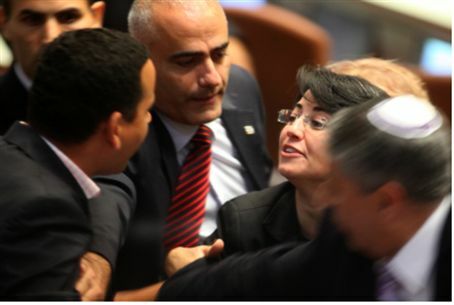 When Zoabi got up to speak, MK Anastasia Michaeli (Israel Our Home) tried to physically remove her from the rostrum. The emotions evoked by the bloody maritime clash broke down some of the traditional barriers between left and right in the Knesset, and seems to have created some rare Jewish unanimity. Arab MKs found themselves under attack not only from Jewish parliamentarians from Likud and more nationalist parties, but also from the left-leaning Kadima. The Knesset Speakers - first Carmel Shama, then Ruby Rivlin - tried in vain to address the plenum from the dais, as the shouting and heckling grew wild. MK Michael Ben Ari (National Union) held up his diplomatic passport and said that Knesset Members like Zouabi and Ahmed Tibi should not be allowed to hold such passports. MK Yisrael Hasson (Kadima) called Zouabi “a shedder of blood” and warned that the Arab leaders in the Knesset shed blood and lead their people to disaster. MK Aryeh Bibi (Kadima) shouted at the Arab MKs that their very presence is a disgrace to the other Knesset Members. He suggested to Zouabi that she grab a pneumatic tube and float on it down to Gaza. Zoabi herself maintained an amused expression and appeared, at least outwardly, to enjoy the attention. When she got up to speak herself the commotion reached fever pitch, as most MKs left the plenum and others shouted, “We will not let the traitor speak!” MK Anastasia Michaeli tried to remove Zoabi from the rostrum, but Knesset guards prevented this. Arab MK Ibrahim Sarsur (Raam-Taal) called out “murderer” at one of the Jewish MKs and was pushed out of the plenum by the security personnel. The debate was recessed to allow spirits to calm.